Articles will focus on the the people-side of project management - team leadership, communication, virtual teams, change management and cultural diversity. If project managers take a change view of every project they lead, they will do a better job engaging the stakeholders in the project and reaching a successful conclusion. That is because when a project manager keeps in mind that the project she is leading is change for someone, she can approach the project from the perspective of the individuals and how they will need to change. Let’s look at a brief example. The individuals who utilize the current processes have been doing so for over five years. Two of the individuals created the original process that is still in use today. There is likely to be concerns around what skills and knowledge will be required to use the new process and associated technology. With this information, Carmella meets with the stakeholders impacted by the project. She shares with them the goal of the process improvement project – to reduce time for processing payment through the use of new technology and thereby enabling stakeholders to be more efficient in their roles and reduce their manual workload. She further tells them that training will be provided before full implementation of the technology so that they are comfortable. And, she invites them to see a demo of the technology. Additionally, she schedule another meeting with them to discuss their current processes with a focus on where they think improvements exist. Carmella is engaging these stakeholders in the project. Regardless of Carmella’s perception of the change, she understanding that the stakeholders need to be comfortable with the change if they are to embrace it. If they are not comfortable, they are likely to resist, which will cause the project to fail. Additionally, concerns among the stakeholders regarding the project and its impact on them personally may impact productivity in the group. When project managers recognize and accept that every project they undertake represents a change for someone in the organization, they will better be able to engage stakeholders in the project. This is done by acknowledging the (potential) impact and addressing early on in the communications and throughout the project the concerns and needs of stakeholders. The executive’s role in project management is as the project sponsor. The project sponsor is a leader, or a group of leaders, who provide the resources and support for a project they launch. The sponsor should ensure a vision for the project and share that vision with the project team. The sponsor should ensure that the project has the budget necessary to be successful. And, the sponsor helps by clearing any barriers that may arise so that the project team can be successful. Has the problem or opportunity been stated clearly? Is it clear who the requestor is? Have you clearly stated how the expected benefits will be achieved? Have you clearly stated the desired end result of the project? Is the goal statement specific and measurable? Is the goal realistic and manageable? Are the objectives necessary, stated clearly, and measurable? Have the major risks and assumptions been reviewed? Are the major risks and assumptions and any contingency plans realistic? Do the stated risks and assumptions allow stakeholders to assess benefits and costs associated with the project? A strong project sponsor plays the role of mentor, catalyst, motivator, barrier remover and boundary manager. Being a project sponsor requires understanding and supporting the project, the ability to influence within the association, and being able to make decisions for the good of the project. Change is essential for organizational growth. And continuous change is desired, provided it is not chaotic. Continuous does not mean chaotic; although unfortunately it often ends up being that way. …we launch a complex change with limited thought and pre-planning. …we neglect to break down a complex change initiative into smaller, more digestible, change bites. …we launch change that does not make sense and keep trying to make sense of it rather than end it. …we launch a change initiative that is in direct conflict with another change initiative already in progress. These are just a few reasons why change becomes chaotic. When this happens, change fatigue sets in and/or the fear of change takes hold. 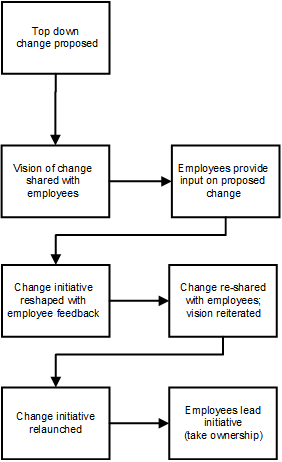 The organization stops changing because employees won’t accept change. Change is chaotic. Change is frightening. Change always fails. Eventually the organization cannot thrive and compete and does not survive. Rather, leadership’s goal is to enable for, encourage and support continuous, but not chaotic, change. To enable for continuous change, think about planning for change as part of your strategic planning process. Change is aligned to achieving a combination of short-term and long-term goals. What better time to think about change that is needed than when you are doing your strategic planning? Have a business problem to be solved as part of achieving a goal, what changes need to be made to solve the problem? Have goals focused on development of new products or services? What changes need to be made to support the development and implementation of those new products or services? …what else is going on in the organization that may impact that change? …are there internal resources available to implement the change? …are current systems able to support the change? If we consider change along with everything else getting done in the organization, we’ll make better decision as to whether it is the right time to launch the change. Maybe we need to hold off, or maybe we can break the change down into smaller components and begin slowly. A good change, launched at the wrong time, risks failure. Better thought and planning around change overall enables for change to be launched that is not chaotic. Employees aren’t stressed and frustrated. Regularly incorporate change planning into your strategic planning efforts and you’ll soon find regular, continuous change is a common occurrence in the organization. Maybe the better question is, is anyone ever ready for change? We experiencing change in our lives regularly – whether it is work-related change or change in our personal life. Some change we drive ourselves and therefore we are ready. Other change may not be by our choice or may happen sooner than we prefer it to. In these cases, we may not be ready and, rather, may balk against that change. Passion. They are engaged in what they are involved in and strive for improvement. They believe much is possible. Optimism. They see opportunities rather than problems. They have a positive outlook overall. Love challenges. Challenges are exciting! They are something to conquer rather than something to run from. They will take calculated risks to find a better way. Resiliency. They can adapt and will bounce back from adversity. They expect that mistakes will happen and make corrections and move on. They have a goal and they are going to achieve it. Confidence. They are confident in their skills and knowledge and their ability to learn new things. They see a problem and are confident they can resolve it. How about you? Are you ready for change? If you aren’t immersed in it now; it’s coming! We can always count on change. One of Abudi Consulting Group's client’s wanted to engage their employees in change. This mini case study shares that story. For this brief story, I’ll use the exhibit below. With so many channels to share their ideas, concerns, thoughts and suggestions, we got more feedback than we could have imagined! Employees shared information about the change proposed as well as the vision for the change. Through the employees’ insights and contributions, Abudi Consulting worked with the executive leadership team to reframe the change initiative. We incorporated many of the ideas of the employees as well as addressed the concerns that they had. The end result was a change initiative that was, effectively, shaped by the employees. This is just one client story Gina shares in her book. Want to learn more? Purchase Gina’s book, Implementing Positive Organizational Change: A Strategic Project Management Approach, J Ross Publishing, 2017.